The tickets actually belong to former Toronto Maple Leaf Stew Gavin, but he gave them to Gavin Management Group client Humble Howard who took me along for the ride. 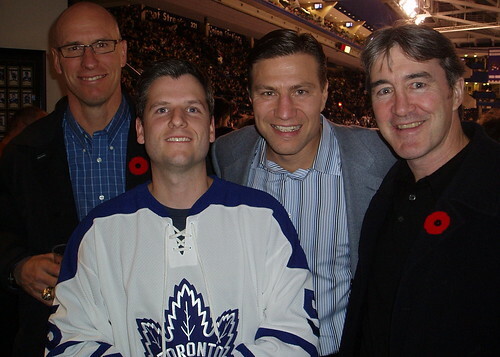 I wasn't just going to a Leafs game, I was getting a chance to hang in the Alumni Lounge. Donning my #5 Bill Barilko jersey, we got there nice and early to watch the pre-game skate. Actually, it was more like the pre-ceremony skate. Mark Messier, Al MacInnis, Ron Francis, Scott Stevens and Jim Gregory were introduced before the game and then there was a solemn Remembrance Day ceremony before the puck actually dropped. The first period wasn't particularly noteworthy, but then we made our way to the Alumni Lounge. Stew Gavin greeted us there and he was with his buddy Jim Peplinski. Peplinski played for the Flames and co-captained the Calgary team that won the Stanley Cup in 1989. It was very cool to hang with both Gavin and Peplinski, but once in the lounge, it was Nick Kypreos who made a bee-line for us. Apparently Kypreos, a genuinely engaging and swell fellow based on our brief convo last night, is rather grateful for the broadcasting experience he gained on the Humble and Fred show. Now that Kypreos seems to be everywhere, hosting a radio show and appearing regularly on Sportsnet, this earned Humble a big hug from the big guy. I was distracted the entire time by his massive Stanley Cup ring. Although he wasn't a part of our little circle, I couldn't help but notice that Eric Bana was hanging in the Alumni Lounge as well. I'm pretty sure he never suited up for the Leafs, but I suppose he knows people. Maybe he knew Gavin? It was a great night. Humble was fantastic company, even buying me a hot dog and Coke, and I got to meet a couple of former Leafs and a former Flame. Here's a photoset of pics I took during the night. Thanks HH! Eric Bana is in town filming The Time Traveler's Wife. Isn't Howard just the greatest? Aren't you just the luckiest to have him as your buddy? I get it. Humble is not humble. It's an ironic nickname, like fat guys named Slim. There is nothing ironic about my nickname. The fact is Howard is the greatest and your just the luckiest that we are buds. Hey why don't you tell everyone you think your "eye candy!"